Good morning! I’m excited about the release of my first-ever novella, Joyfully His! For those who’ve read the Sterling Canyon series, this is Andy’s book. I hadn’t originally planned to write a story for Andy, but after watching him grow throughout the series–and at the prodding of some readers–I gave him a happily ever after, too. This is a quick, lighthearted read, and I think you’ll really enjoy meeting his heroine, Nikki. I hope the story makes you smile and delivers a bit of holiday spirit early. And speaking of holiday spirit, I’ll be donating 10% of the first week’s proceeds to St. Jude Research Hospital. 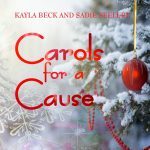 I should note here that, if you are feeling particularly giving, my daughter and her friend have a sweet, acoustic Christmas album out (Carols for a Cause) and they are donating 100% of ALL REVENUE this calendar year to St. Jude, too. It’s available at Amazon and iTunes. My favorite song is my daughter’s version of The First Noel, followed closely by the duet mashup of Silent Night/O Holy Night.